We’d like to thank everyone for getting in touch on this special day. 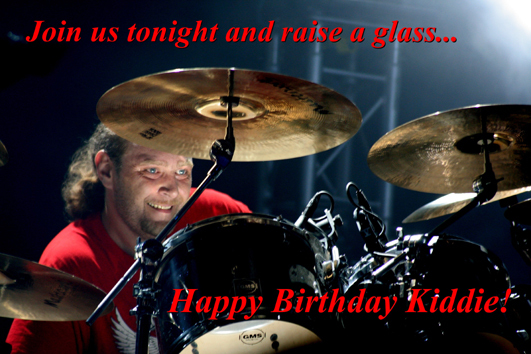 It’s very comforting for us, and of course Kiddie’s family, that so many of you remembered his birthday! We’ll all be meeting up tonight, to celebrate and remember the time we were fortunate enough to have spent with him, the one and only Coventry Kid. 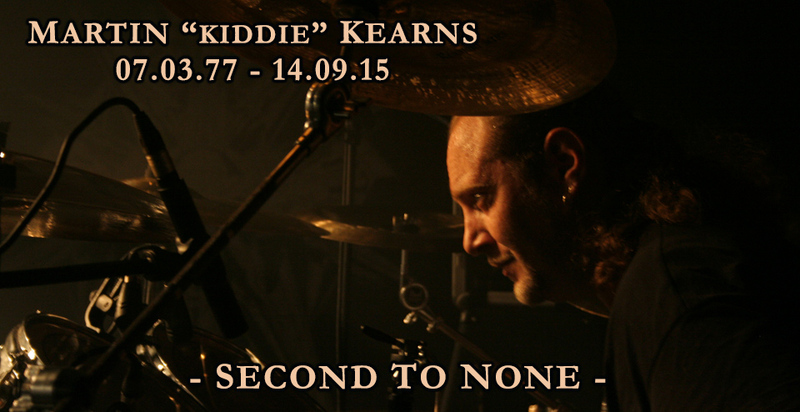 Martin “Kiddie” Kearns - never outclassed, never replaced, never forgotten. Today would have been Kiddie’s 40th Birthday, it’s a day of sadness, but also of great memories, and we hope you’ll join us and raise a glass to an absent friend. We take comfort in the knowledge that his bloodline, and legacy as a father, will live on through his sons Leon and Max, his legacy as a man lives on in the hearts and minds of everyone who had the honour and privilege to call him their friend, and his legacy as an amazing drummer will live on through his music. But sadly due to various circumstances, Kiddie only ever got to release 2 albums with Bolt Thrower, despite being in the band for 20 years and playing hundreds of shows, and we owe his unswerving loyalty and drumming legacy so much more. On behalf of ourselves and Kiddie’s family, we would like to thank everyone for their thoughts and support over the last 12 months. Together with Kiddie’s family we made the conscious decision to keep his unexpected death a private matter, and to take time out to deal with it all. When Kiddie joined us back in 1994, although he was only 17, he instantly improved Bolt Thrower as a live band, and no one was more loyal to, and prouder to be in Bolt Thrower than him. We spent over 20 years together, touring the world, with 3 different vocalists, but he was so much more than just a drummer to us. So when we carried his coffin to his final resting place, the Bolt Thrower drummer position was buried with him. 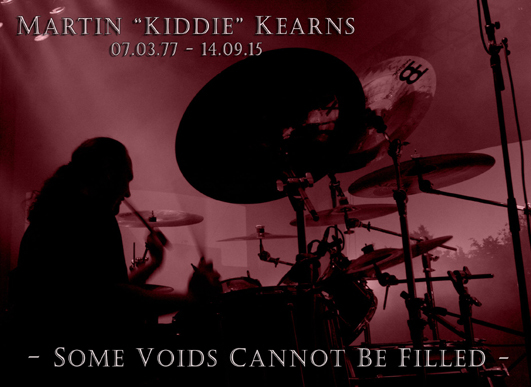 He was, and will now forever remain THE Bolt Thrower drummer, our Powerhouse and friend Martin “Kiddie” Kearns. With the heaviest of hearts, and still numb from shock, we have to share the very sad news that on Monday 14th September Bolt Thrower lost our powerhouse drummer, Martin ‘Kiddie’ Kearns. After the first rehearsal for our upcoming tour of Australia, Kiddie suddenly felt unwell which continued throughout the night, and the next day he passed away peacefully in his sleep. 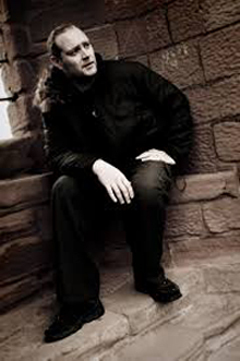 He was a fantastic Dad, husband, son, friend, but to us he was always ‘Kiddie’, the same 17 year old Coventry kid whose drumming style and personality blew us away when he first walked into our rehearsal room 20+ years ago. Kiddie enriched our lives, and the Bolt Thrower sound. He leaves a massive hole in the lives of everyone who knew him and will be very sorely missed by many. At the end of September it will be exactly 22 years since we played in Australia. 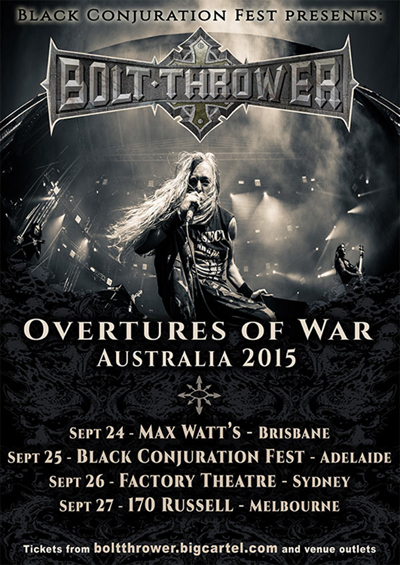 So with the help of Black Conjuration Fest, we’re chuffed to add Australia as the next country on our revisit list. Australian outlaws Cauldron Black Ram will be joining us as national support, with other local support coming from Portal, Cruciform, Inverloch and Beyond Mortal Dreams. Continuing down the path of revisiting places we haven't been to for a very long time, we're happy to announce that the next country on our list is Canada! Well it's just over a week since we had the pleasure of playing the Damnation Festival, which was our last show of 2014. So all that’s left is to say a massive THANK YOU to each and everyone of you who came to see us on our Overtures of War tour. We were blown away by the turnout each night, never imagined so many people would want to see BT in 2014! Cheers also to Morgoth, Soulburn, Incantation and Vallenfyre for making it an even more enjoyable experience, and to everyone else involved in helping out with the tour. Finally, as always, huge thanks to our long suffering crew! First in, last out..
We've completed the line-up for the tour and we've got some killer bands joining us. We already have Morgoth on board, and now we can also announce Soulburn, Incantation and Vallenfyre will be joining us for selected shows! 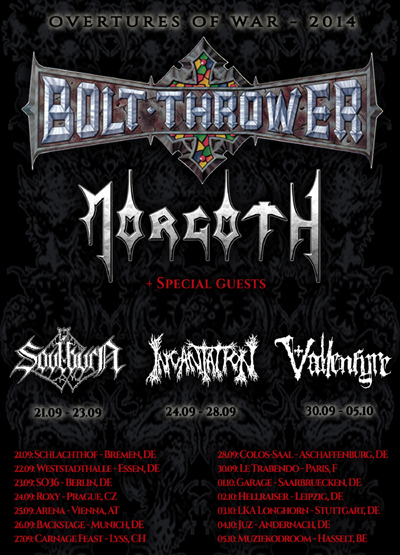 Looking forward to hanging out with old friends again and meeting new ones..
We’re happy to announce that the German death metal pioneers MORGOTH will be joining us on the tour. It’ll be their first tour since 1997, so needless to say we’re chuffed they decided to do it with us! Tickets are now on sale, check the venues (listed here) for details on where to buy them. Tickets will go on sale soon, check the venues for more info. Links to each venue can be found on the Tourdates page. Still working on support bands, so more details to follow. In Båten There is No Law! We'll definitely kick off our 2014 shows in style... with our first ever gig on water! 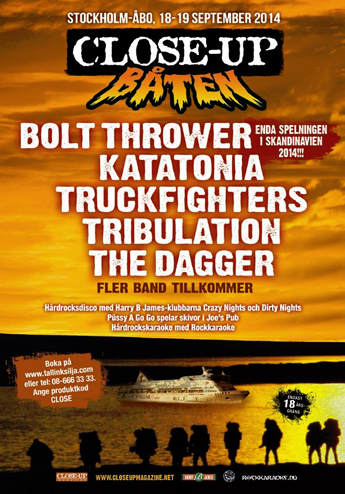 We'll board the Close-Up Båten, organized by Close Up Magazine, Sweden's no.1 metal journal, on 18th September.. Following the Damnation Festival, we'd like to confirm our second show for 2014: the Baroeg Open Air in Holland. The Baroeg is one of our favourite clubs, and their annual FREE festival is a true reminder of what the Baroeg is all about, and we're happy to be able to support it. This will be our only open air festival in 2014. We're also chuffed to announce we'll be returning to some of our favourite European venues in the Autumn. We're especially looking forward to playing some German club shows again, something we haven't done for 8 years now. Well we've overcome the jet lag and have been looking back on the killer time we had in the USA.. The tour didn't get off to the best of starts though; we turned up at Baltimore not knowing if we could even play due to severe thunderstorms in the area. Thankfully we eventually got the green light, but the combination of bad weather, poor organisation, a town curfew, etc. meant that we only got to play for a chaotic and under-par 50 minutes. Luckily the shows that followed were problem free, and we'd like to thank everyone who came along to see us, we were blown away by both the turnout and the reaction each night. Teaming up again with the legendary Autopsy for the two Californian shows was an absolute pleasure. And of course we're very chuffed that we finally got to finish our US business with the Benediction hooligans. Cheers to Timmy the Texas Turd, all the local promoters, Josh Barnett, The Damned, Noothgrush, Hellshock, Night Nurse, Deathraid, Jungle Rot & Witchbanger, who all helped make the shows even more enjoyable. 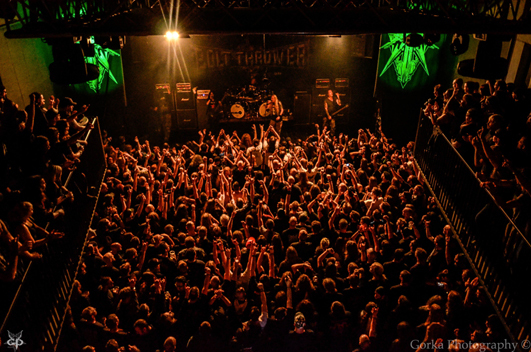 And, as always massive thanks to our long-suffering crew who continue to help keep the Bolt Thrower machine rolling. Hopefully it won't be another 20 years till we hit US soil again..
And it's our pleasure to announce that for all the club shows we'll be sharing the stage with our fellow compatriots Benediction; and for the Pomona & Oakland shows we'll also be joined by the mighty Autopsy! Tickets are on sale now, check the venues for more info. As the shows we played this year are over, we as always would like to thank everyone who came from all over the world to see us. From the humbling celebration of Boltfest through to Ieperfest situated in the historic Flanders Fields, we had a blast! 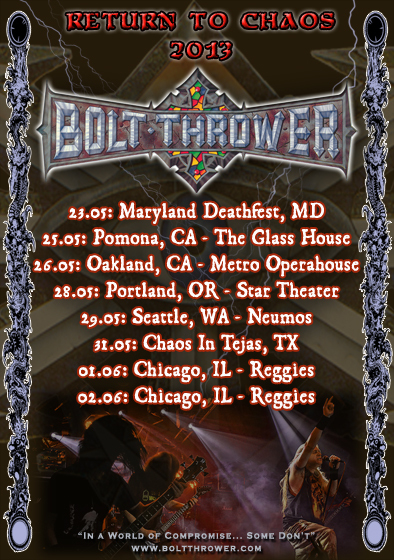 We've now started picking gigs for 2013, and so far we can confirm the following shows..
First of all, we're really chuffed to announce that Bolt Thrower are returning to the US for some festivals/club shows. We will be playing the Maryland Deathfest indoor show at the Sonar in Baltimore on Thurs May 23rd, and also making our first trip To Texas since 1991 to play the Chaos in Tejas festival in Austin just over a week later. 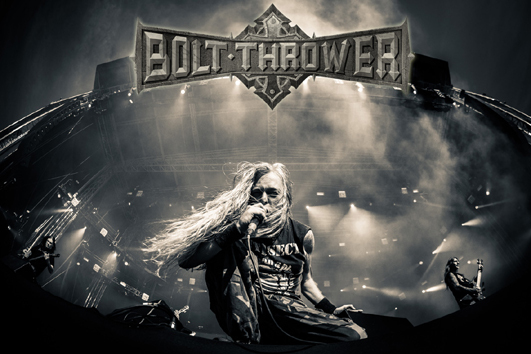 And next up will be Finland, another part of the world Bolt Thrower hasn't played for a while, where we will play Tuska Open Air Festival, on Friday 28th June. When we first started planning Boltfest over a year ago, it was just gonna be a birthday bash, a chance to celebrate with friends along with the opportunity to raise some money for a great cause. We had no idea it was to become such a memorable event for all involved, and went way above our expectations. £12,411.80 (approx 15,000 Euros / $20,000)!!! The money has already been handed over to TCT, so on behalf of them we'd like to thank everyone who donated by participating in Boltfest. We are very chuffed to announce the bands joining us at our Birthday Bash are: AUTOPSY, DISCHARGE, BENEDICTION & VALLENFYRE. 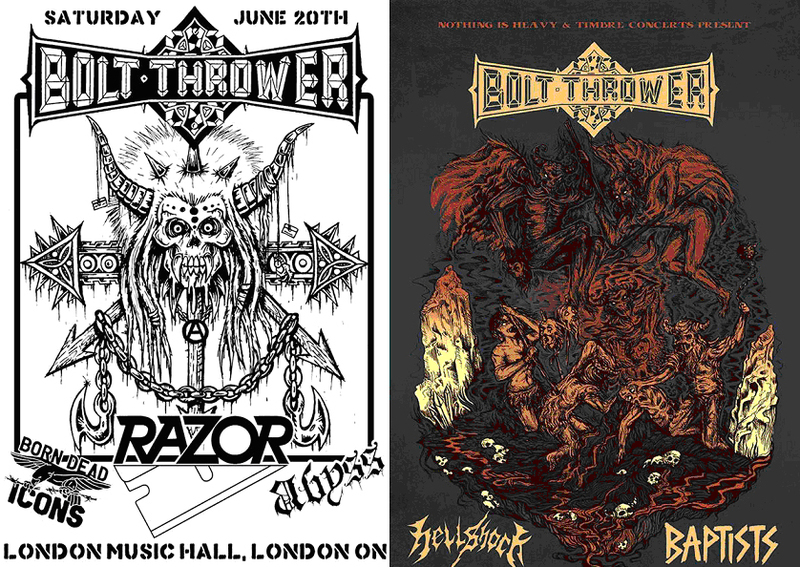 Every band on the bill has contributed in one way or another to some great memories over the last 26 years of Bolt Thrower, so it's an absolute pleasure to have them all onboard!! Seeing that all five bands on the bill only play a few select shows a year, this should be a very special night! More info about all the bands can be found here. 200 extra Balcony tickets will go on sale at 20:00 GMT on Wednesday 7th March. Pay No More than £5.99! Obviously you can't charge people to come to your own birthday party, so as soon as we came up with the idea for Boltfest, we decided we should pay all the costs for the event ourselves. We also wanted to use Boltfest as an opportunity to do some good, and turn it into something more than just another show. So we've decided to ask everyone to donate £5.99 to charity if they want to come to the party. This way, with your help, we hope Boltfest will raise £10,000 for a good cause! The charity we've chosen is Teenage Cancer Trust*. We're sadly among the millions whose lives have been affected by this devastating illness, and have seen first-hand the work charities like Teenage Cancer Trust do, and the difference it makes in those difficult times, so we're very happy to be able to support this deserving charity. Tickets are limited to 1800 and can be bought at the HMV Ticket shop from Friday 16th Dec 09:00 GMT. There'll be no service charge, as the HMV Ticket Shop has generously waived these extra costs for this special show. This way ALL the proceeds from the event (minus obligatory 3% PRS) will go to Teenage Cancer Trust. Check here for ticket info, news and line-up announcements. *Teenage Cancer Trust is a registered charity, no. 1062559 (England and Wales) and SCO39757 (Scotland). Well, after meeting a lot of people and looking for suitable clubs, we've finally found a great venue along with some like-minded people to host the Bolty Birthday Bash – BOLTFEST. 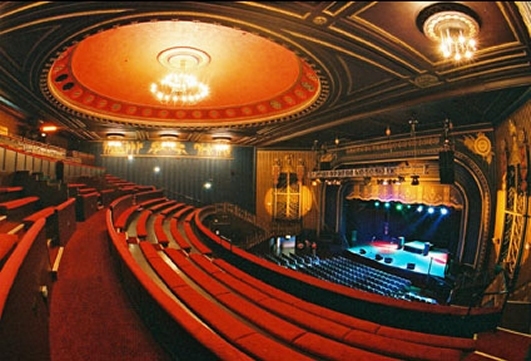 It will be held at the prestigious HMV Forum in London, on Saturday 7th April, 2012 (Easter Bank Holiday weekend). More info on tickets, bands, etc. coming soon..
Anniversaries are kind of easy to achieve. For a band, just don't split up and you'll reach one, whether it's 10, 20 or 35 years. And this year we've reached '25 years of not splitting up'! We managed to stop others from making a big fuss about it, and didn't give in to the numerous offers and suggestions on how we should cash in on it! But it has made us appreciate the opportunities we've been given since 1986, and that we've been able to do everything we wanted to do without compromising in any way. We've been lucky enough to have played a lot of killer shows with great bands and met a lot of very cool people over the years, and we think that's the stuff that deserves some kind of celebration. So, we want to organize a Bolty Birthday Bash, where we can reunite with some of these bands and invite you, the people who have supported us over the last 25 years. We were hoping to have everything worked out by now, but it turns out organizing a free show comes with its own unique problems, but we'll get there in the end! Well, that's all we can say for now, there will be more news to come soon, so keep checking back.. It's only a few weeks until we play our last show of 2011, at this year's Metal Invasion Festival. The festival runs over 2 days – 14th-15th October, (BT plays on the 15th) and tickets are only 43 Euros for a killer line-up including Amon Amarth, Die Apokalyptischen Reiter, Sodom, Soilwork, etc. So, considering the bill and price, it's not surprising that when tickets first went on sale it sold out so fast a decision was made to move the festival to a bigger venue, the impressive Messehalle in Straubing, Germany. So those of you who have already bought a ticket, please note the change of location. It's getting close to selling out at the new venue, but there's still time to get a ticket here. We're really looking forward to playing an indoor show in Germany again, our first since 2006! See you there..
Congratulations to our favourite MMA fighter, the mighty Josh Barnett, who ground and pound his way into the final of the Strikeforce World Heavyweight Grand Prix after choking his opponent Sergei Kharitonov into submission in the first round of his fight on Saturday night. As if this wasn't enough, he has ditched his old moniker 'The Babyfaced Assassin' in favour of a name tailor-made for him, 'The War Master' ...no idea where he got the idea from! So, massive congrats Josh, we're very grateful and honoured to have you fly the Bolt Thrower flag. Roll on the final..
We handpicked a small number of festivals to play in 2011, and the first was in June at Hellfest in France. This festival is pretty daunting in size, but has such a great atmosphere, impressive line-up and faultless organisation, you can't really go wrong. We had a blast playing the Rock Hard tent, it gave us that familiar indoor gig feeling, and the weekend was rounded off by meeting up with old friends we hadn't seen for years and getting to watch some killer bands. 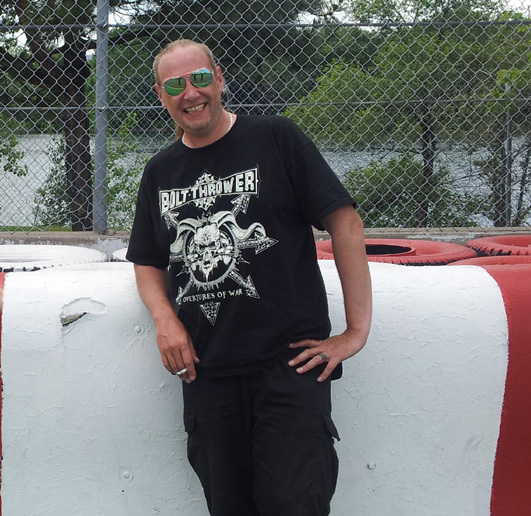 Great weekend..
Last week was Summer Breeze in the beautiful sleepy town of Dinkelsbühl, Germany. SB is the only festival we've ever played twice, and if you've ever been you'll know why. The 30k crowd were the most enthusiastic (and biggest) we've ever had the pleasure to play in front of. And amazing scenes we'll never forget at the BT merch booth, when we had our very first crowd surfer! Why is there never a camera around when you need one..?! So, massive thanks to all of you who came out in numbers to help make these shows really special for us. It's very much appreciated! It feels like a long time ago since we played the two special shows in Atak, and now we've just got back from our amazing first ever shows in Greece, which sadly means we've reached the end of our Next Offensive tour across Europe. Every single show was an absolute pleasure, and we got to meet up with old friends again and also made a lot of new ones. It was great to be joined once again by Benediction and Asphyx, along with the other 30 bands who took part on the tour - too many to name, but you know who you are... (Cheers all!) We would also like to say what an honour it was to share the stage with Rotting Christ, the coolest and most genuine guys you could meet. Thanks also to all the promoters on the tour for helping set up the shows and going along with our crazy ideas, and for making us feel so welcome. Finally, of course huge cheers to each and every one of you who came to the shows in such large numbers. Your support for Bolt Thrower is never taken for granted, and always very much appreciated, and we hope you had as much of a good time as we did! Well, we're in the final preparations for the tour, and so far so very good.. The rehearsals are going well, and the last few support bands are now confirmed. The response to the tour has been pretty overwhelming, and the tickets are selling fast, with more and more shows selling out in advance. So, to those of you who are planning on coming but haven't bought tickets yet, particularly if you have a long drive ahead, please check the venue before you set out to make sure there are tickets available on the night. Over 100 bands registered their interest to open up for us on the UK/Irish shows in April/May. We gave every band a good listening to, a process which took about 10 days! We were pleasantly surprised at the quality created out there and are sure the future of UK extreme metal is in safe hands! Thanks to Terrorizer and to everyone who applied. In addition, the Polish support acts for the highly anticipated show in Warsaw on 11.05.10 have also been picked. We are happy to announce the line-up will now include Rotting Christ along with Lost Soul, Nomad and Naumachia. Unbelievably the extra show at Atak, on the 28th April has now also sold out in under a week! We're really looking forward to a thoroughly enjoyable couple of days in Enschede. And for those of you who suggested it, no, there will not be a third show, everybody involved is already facing financial ruin with these two shows! Although it's still a couple of months away, we'd like to say massive cheers to all 1600 of you who bought a ticket, and special thanks go to Jurgen & the rest of the Atak crew, the guys at Grolsch, and all the bands playing, for going along with this crazy idea! We were blown away that all 800 tickets for the upcoming Atak show in Enschede sold out in less than 2 days. But unfortunately this was before a lot of people who usually come to our shows at Atak even got to hear about it. A lot of people contacted us about this and the fact tickets for the show are now being sold on for a lot of money, and that is the last thing we wanted when we came up with the idea for this special show. So, after some more talks with Grolsch & Atak, we all decided to put on an extra show the day before, on Wednesday 28.04.2010 for the same conditions: 5 Euro deposit will get you a ticket, a special "No Grolsch, No Glory" shirt and a flip top Grolsch beer. As an extra bonus, it's always been a dream of ours to play the same club two nights in a row; being able to walk into a club the next day with the backline still set up and everything ready to go, etc. So it's a real pleasure that this will finally be happening at the Atak club. The line up for the second show is not 100% confirmed yet, but Benediction will be playing, along with 2 other bands. We will also have a different version of the "No Grolsch, No Glory" shirt for the second show, and we will be in touch for the sizes as we did for the first show. But please note there will only be one shirt and one Grolsch per person, so if you turn up on your own with 5 tickets, you'll only get one shirt and one Grolsch. We want to fill the club with people who are into the music, not just shirts and beer! Want to play one of the UK shows? In collaboration with Terrorizer magazine, we are inviting one local band to play each night of our UK dates with Rotting Christ. UK's finest, Benediction and The Rotted will also be playing some of the shows. 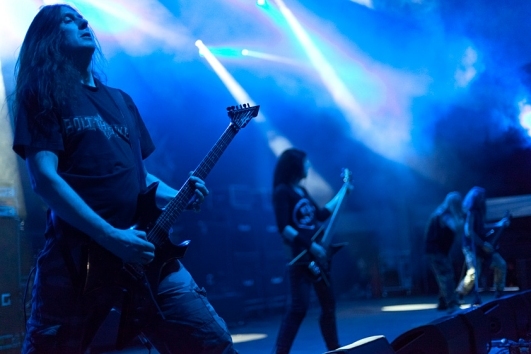 If you want a chance to be one of the chosen bands, just register on the Terrorizer homepage here, fill in the form and tick the shows that you would like to play. We will check out your band, decide who we'd like to share the stage with, and then get in touch with you. Not only do we have the pleasure of taking the Greek giants Rotting Christ on tour with us, but we can soon say that we have played in their homeland too. 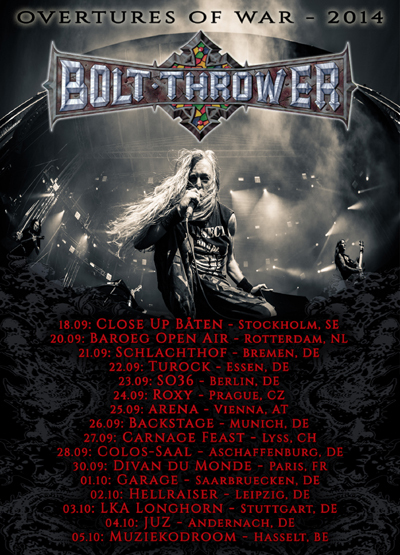 As for the first time ever, Bolt Thrower are coming to Greece! We were so fed up with being harassed by the crazy Greek maniacs who have been following us all over the world, and being stalked for many years by the most persistent of promoters, Harry Katinakis, that we have finally given in to their pleas to come over. The dates are: Saturday 29th May in Thessaloniki at Principal Club Theater, with support coming from Terrordrome and Mass Infection. And Athens, Gagarin 205 on 30th May, where support will be Suicidal Angels and Inveracity. Tickets will go on sale Monday 11th January. 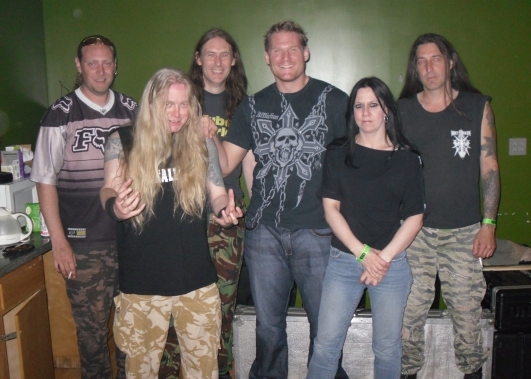 Bolt Thrower has always had a special bond with the Atak Club in Enschede / Holland. The small 300 capacity club was one of the first to start booking extreme bands in the late 80's. 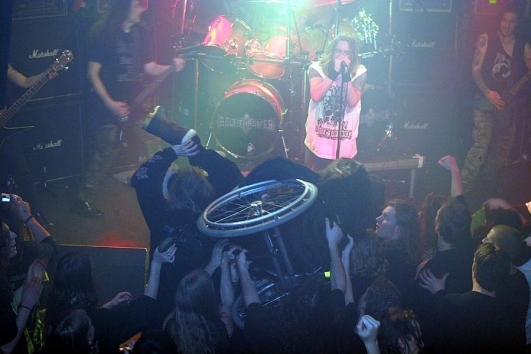 It was famous for it's out of control moshpits, stagedivers jumping off the balcony and crowd surfing wheelchairs! 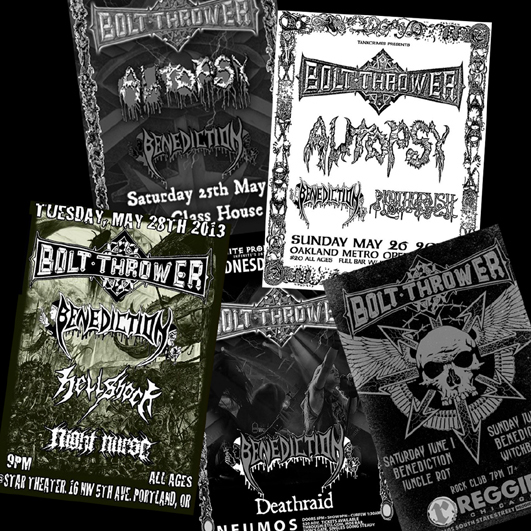 It's the only club Bolt Thrower have played on every tour in the last 20 years, 11 times in total, a true cult club and a real home from home for us. Sadly in 2008, after being battered beyond repair over the years, the old lady had to close. 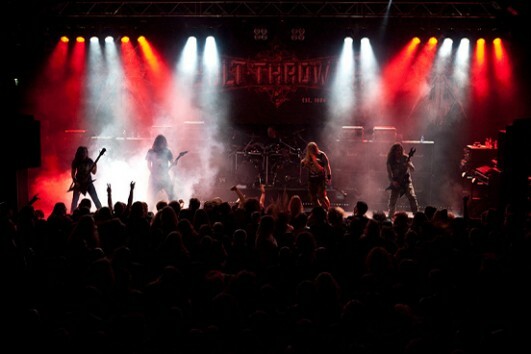 Atak gave Bolt Thrower the honour to play the last show ever there, which we celebrated with 300 guests as a special free show. The show will be on April 29th, and Asphyx, Rotting Christ and Dew-Scented will be joining us on stage. But, to stop people just ordering tickets and then not turning up, we will be asking for a 5 Euro "deposit". Then at the show you will get a special "No Grolsch, No Glory" Bolt Thrower T-Shirt and a Flip Top bottle of Grolsch beer! We are pleased to announce the first bands accompanying us on our short tour in April/May. Support on the whole tour comes from the mighty Greek veterans, Rotting Christ! And to mix the package up a bit for everyone, there will be different additional bands playing each night, and so far we've asked Benediction, Asphyx and Dew Scented to play a few shows each. And as usual, there will also be local/unsigned bands on the bill. More bands/details will be announced soon. On another note, we're planning something special for the first show on the tour, in the new Atak venue in Enschede, Holland. 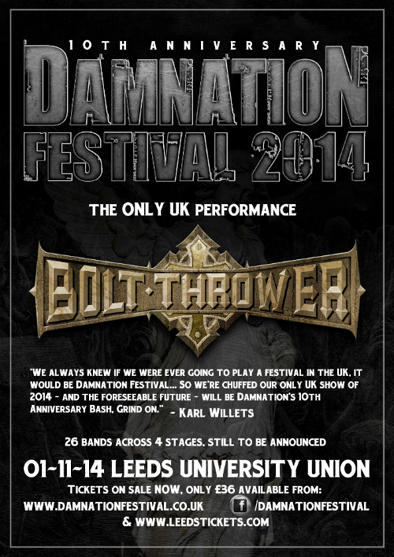 More info on that will follow soon.. Keep checking the Bolt Thrower & venue's websites for all the info. All the shows are now confirmed, you can find them here. We, for one, are really looking forward to these shows, we'll be playing some of our favourite old haunts, also revisiting places we've haven't played in years. We hope that by playing such a variety of shows, from intimate clubs to larger open air festivals there will be something for everyone. We'll be trying to make every show memorable, so watch this space for further details. Tickets for the club shows will go on sale as soon the support bands and door prices are confirmed. The short tour we planned for the Spring has been moved back. As when we contacted Wito, one of our favourite club owners, about playing a show in his club he asked us to play the festival he was planning on his birthday instead. And we're sure that anyone who has had the pleasure to meet Wito or has been to his Hellraiser Club in Leipzig, Germany will understand why this was an offer we couldn't refuse. 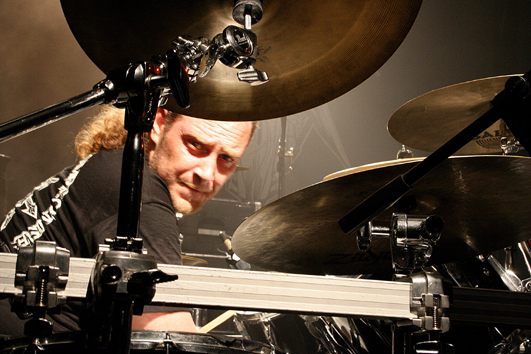 Wito's birthday bash is on 13.05.2010 and is part of the 3 day Metal Fest event in Dessau, Germany. This will also be the only German show / festival we'll be playing in 2010. More info can be found here. 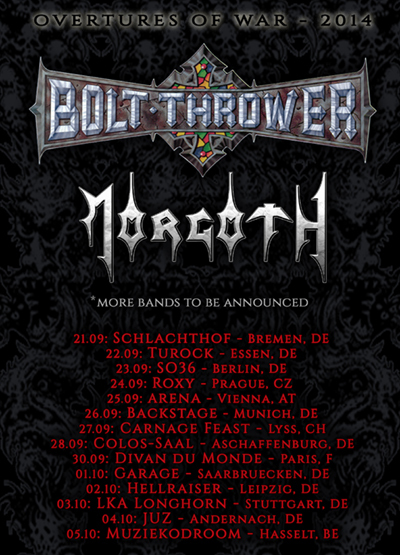 Please keep checking for updates..
Bolt Thrower are currently planning a short European tour in Spring 2010. So far we are looking at playing shows in Holland, Belgium, Germany, Switzerland, Austria, France, and the UK. As soon as the gigs are confirmed they will appear on the website, so keep checking for more info. We've had a great couple of weekends, the first being at the Rock Area festival in Germany at the legendary Loreley Amphitheatre. We doubt the location can ever be matched, it was certainly the most amazing place we've ever played, and we had a killer time too. And then there was the Birmingham bash.. Playing another gig with the Benediction hooligans was a real pleasure; we had a real blast both personally and professionally. As always we'd like to thank the crew and everyone who came to both shows. The gig at The Asylum in Birmingham on 29th August is sold out. Sorry to those of you who missed out on buying a ticket. Please don't bother turning up on the night unless you have a ticket as you will be turned away. 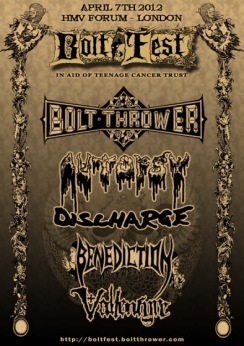 Bolt Thrower will be playing a special Birmingham show at The Asylum with Benediction on August 29th, which is also Frank Healy's 65th birthday. (Sorry Francis!). More info and ticket details can be found here: www.theasylumvenue.co.uk. We're looking forward to playing our own back yard again, with our old partners in crime Benediction. Hope to see you there.. So, we are back from a thoroughly enjoyable long weekend in Baltimore. We had a killer time back on US soil and it was great to meet up with old friends again, as well as making new ones. We were totally blown away with the response we got for both shows, and that people in the US still remembered us! Massive thanks to Ryan and Evan for the invitation, and making it such an easy and enjoyable time for all involved, and for granting our wish to play the indoor stage for the impromptu second show. Finally, cheers to everyone who travelled to see us, everyone we spoke to and hung out with, and thanks again to the BT crew for all their help. 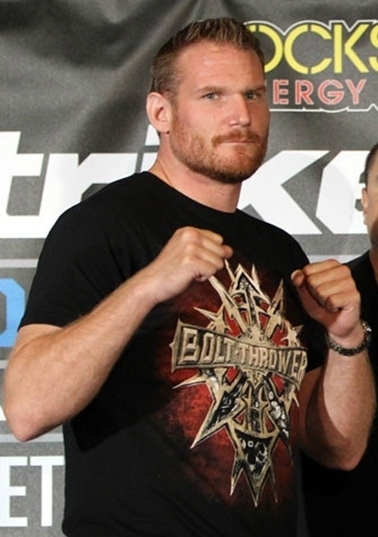 Hails once again to our MMA fave, Josh Barnett!! Congratulations to The Baby Faced Assassin on another killer victory, this time against Gilbert Yvel, on Saturday 24th January at the "Affliction: 'Day of Reckoning" in Anaheim, California. Josh, looking every inch the mighty warrior, dominated from the onset. He constantly pummelled away at Yvel who received a relentless stream of ground and pound, and pinned to the canvas for the majority of the fight, resulting in Yvel receiving one blow too many and tapping out in the third round. "There is no shelter from the Barnett steel rain!" This legendary Amphitheater located on top of a massive soaring rock overlooking the Rhine, has got to be one of the coolest places in the world to hold a festival like this and we would like to congratulate the Rock Area crew for getting into this location where so many others have failed! In addition, the full line-up and running order has been confirmed for the 2009 Maryland Deathfest VII, in Baltimore, USA. 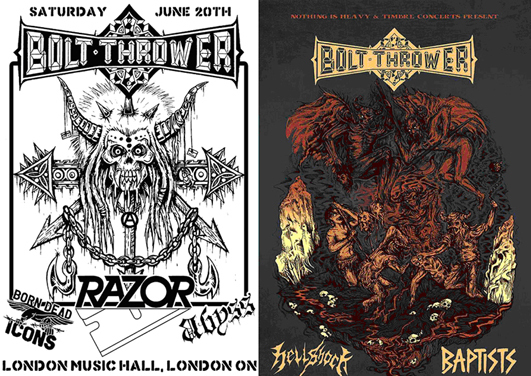 Bolt Thrower will be playing on Saturday 23rd May, and with this line-up it'll be great to see some old familiar faces again.